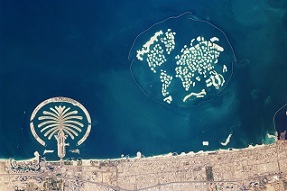 United Arab Emirates, a country in the Southeast Arabian Peninsula in Southwest Asia on the Persian Gulf, bordered by Oman, Saudi Arabia, Iraq, Kuwait, Bahrain, Qatar, and Iran has a total land area of 32,278 square miles and a population of around 4.8 million. Abu Dhabi is the capital of this union of seven regions ruled by emirs. It is a country of contrasting features – sand dunes, oasis, mountains, plains. Date palms, eucalyptus, and acacia are native to the desert and with effort Arabian oryx and leopards are increasing their numbers in the wild. It is classified as a high-income developing economy by the IMF. Many economists contend UAE to be the wealthiest country as it has the highest average income in the world and a sizable trade surplus. The major sectors of its economy are petroleum and natural gas. November through March is the best time to visit UAE. From its architecture, music, cuisine, and lifestyle it is quite evident that its culture is a blend of Islam and Arab influences. The Sheikh Zayed Mosque, The Dubai Fountains, Burj Khalifa, and the Wild Wadi are places of interest. Traditional food is based on rice, meat and fish. Seafood is used in plenty and in the meat category goat and lamb are favored. Typical local dishes include shawarmas (carved lamb or chicken carved from a spit and placed inside a pita bread with hummus, and salad), falafel (mashed chick peas and sesame seeds rolled into balls and deep fried), hummus (creamy chick pea and tahina dip) and tabbouleh (buckwheat mixed with parsley and mint). Lonely Planet Oman, UAE & Arabian Peninsula 978-1741791457 $22 Has a detailed traveler’s introduction covering about 100 pages. UAE coverage is around 80 pages. Oman and United Arab Emirates by International Travel Maps 978-1553413561 $12 1:1.4M Scale. Includes Inset Map of Dubai and Central Muscat. The first stamps of United Arab Emirates (UAE) were UAE overprints on issues of Abu Dhabi showing a portrait of Sheik Zaid bin Sultan al Nahayan in different colors and denominations issued in August of 1972. The set (Scott #1 to #12) catalogs for around $750 MNH or used. Sheikh Zayed bin Sultan Al Nahayan was the principal architect of UAE and was the ruler of Abu Dhabi and President of the UAE from 1971 until his heath failed in 2004. He was admired in his country as a relatively simple man who successfully guarded the culture and traditions while presenting a civilized image to the west. He was respected in both US and Europe as a moderate ruler. The first original issues of UAE were a set of twelve stamps released on January 1, 1973 showing local scenes. The set (Scott #13 to #24) catalogs for around $95 MNH and around $45 used. The designs show Map and Flag of UAE, Coat of Arms of UAE (Eagle), Almagta Bridge in Abu Dhabi, Khor Fakkan in Sharjah, Steel Clock Tower in Dubai, Buthnah Fort in Fujeira, Alfalaj Fort in Umm al Qiwain, Khor Khwair in Ras al Khaima, Palace of Sheik Rashid bin Humaid al Nuaimi in Ajman, and Sheik Zaid bin Sultan al Nahayan in Abu Dhabi. Khor Fakkan is a coastal town considered to the most beautiful part of UAE. It is a popular tourism spot and there is a major container terminal. Oil was discovered in Abu Dhabi in the early 60s and currently UAE has the world’s sixth largest oil reserves. Before 1971, the UAE was known as the Trucial States, so named because of a 19th century truce between the United Kingdom and several Arab Sheikhs. The states issued a number of stamps in the 50s and 60s mainly as a source of income by serving the philatelic market. Those stamps (CTOs) have very little value. A long set of nineteen stamps released between 1982 and 1986 showing National Arms Symbol in different colors and denominations. The set (Scott #142 to #157) catalogs for around $100 MNH and around half that for used. A similar set was released on August 15, 1976 in the Coat of Arms theme and that set (Scott #69 to #82) catalogs for around $45 MNH and around $20 for used. This latter set is considered as the most recognized stamps of UAE. A set of two stamps released on April 20, 1992 for the Seville Expo. The set (Scott #383 to #384) catalogs for around $60 MNH or used. The bulk of the valuation is for #384 as it was withdrawn after a short period due to poor rendition of Arabic word for ‘Postage’. The design shows Al-Jahli Castle Al-Ain. A set of four stamps released on February 25, 2003 showing items in Al Ain National Museum. The set (Scott #727 to #730) catalogs for around $12 MNH or used. The designs show jar from Hili Tombs, pottery from Umm an-Nar Tombs, bronze axe, and soapstone vessel. The first coins of United Arab Emirates were Standard Coinage (100 Fils = 1 Dirham) Bronze Fils in the FAO series issued in 1973 showing Value in Obverse and Date Palms and date in Reverse. The issues had mintage well into the millions and catalogs for around a dollar in BU. The first gold coin was a 0.5886 troy ounce 500 Dirhams proof issued in 1976 to mark the 5th anniversary of United Arab Emirates. It shows dates and anniversary inscriptions in Reverse and trades at a slight premium over bullion value. Coins $2 and up UNC Fils from the 1970s and Dirhams from the 1990s starts around $2. Year Sets and other UNC sets with 10-pieces or more start around $10. Silver UNCs and Proofs start around $50. Gold Coins and Proofs go well into the 100s. Paper Money $4 and up UNC Dirhams from the 1980s onward starts around $4. High Value UNCs starts around $10. Bundles, Rare Dates, etc go well into the 100s. Copper coffee pots, carved wooden camels, camel bags, and carvings from camel bone, sheesha pipes, kanjhar (dagger) and jewelry are typical novelty items from Dubai. Miscellaneous Collectibles $2 and up Stickers, Patches, Postcards etc start around $2. Themed Porcelain Collector Plates, and Bowls start around $20.